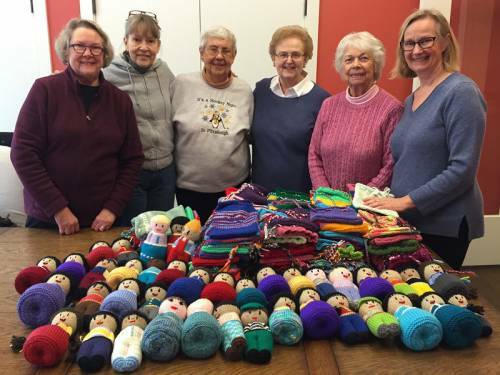 Members of the group Knitting for Mission at Sewickley Presbyterian Church outside Pittsburgh meet Thursday afternoons to transform leftover yarn into personal medicine bags and dolls, which a member personally delivers each summer to a medical mission in Honduras. 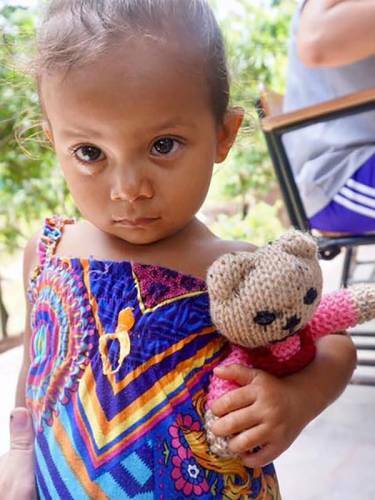 During a summertime medical mission, a group member and her daughter delivered about 400 hand-knit bags and more than 100 knitted dolls to Hondurans receiving medical and dental care. Anywhere from four to 10 knitters show up on any given Thursday to knit, learn and commiserate. During the most recent two-week medical mission, doctors, dentists and the O’Kanes saw more than 2,600 patients and distributed nearly 5,900 bottles of medicine — some tucked into the knitters’ drawstring bags. O’Kane said Knitting for Mission members take pride in delivering their products themselves, rather than boxing them up and shipping them where they’re needed. In addition to Honduras — knitters are selling items at the church during the coming weeks to purchase medications for next year’s mission — the knitted items are donated to a nearby men’s shelter and to victims of domestic abuse. Merrill said community support is helping Knitting for Mission to broaden its reach. The Rev. Sarah Bird, the church’s associate pastor, called it a joy to “see how the Holy Spirit brought these ladies together around such a simple, ordinary, lovely hobby to create community, generosity and hospitality that demonstrates God’s love” for people. Loving God and precious Jesus, you chose to bless our children in a special way. Their innocence and loving hearts help us see your light in a fractured world. We pray that we can continue to be your loving arms, no matter our rage, stretched out to embrace the weary and rejected. We pray in Jesus’ name. Amen.